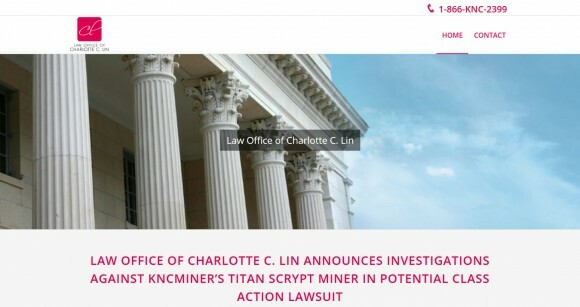 The Law Office of Charlotte C. Lin has announced that it is investigating KNCMiner for possible breach of implied warranty of fitness, misrepresentation, and other violations of law by failing to provide a functional or usable product, false advertising; failing to deliver product within adequate time frame, and failing to provide refund upon demand. The Law Office of Charlotte C. Lin is inviting everyone who is not satisfied with his Titan order from KNC to contact them in order to get more details on what possible legal actions can be taken against the company. Under the terms of the advertised Titan, it should “Yield a minimum of 300 MH/s” and “purchasers shall also receive the Titan during Q3 of 2014” both of which have certainly been up for debate in the mining community at large. The investigation relates to whether the Titan delivered hashing power below advertised, whether the Titans were delivered late, whether such violations breached its Implied Warranty of Fitness and whether KNCMiner made misrepresentations.